So excited about this wrap - its one of our favourite products! Super soft and drapes in such a flattering way. This is no ordinary cardigan. The Light Taupe Sangha Maternity and Nursing Cardi as seen on Hong Kong celebrity mom, Aimee Chan . Designed with subtle yet well-thought functional features for maternity and breastfeeding use, this stylish soft jersey cardi is a versatile and fundamental addition to any pregnant or nursing mom's wardrobe. 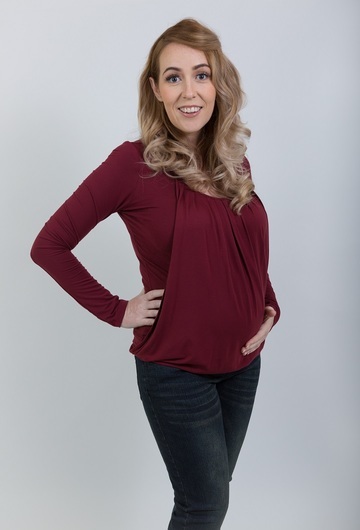 Crafted in a soft, breathable and light weight eco-friendly bamboo knit fabric, this maternity and nursing top is the perfect layer for not so hot and not so cold days. Throw it over your tank, tee or bandeau top for a light cover. With its stylish drape and lush soft hand feel, this cardi offers versatile use, from pregnancy to post nursing.